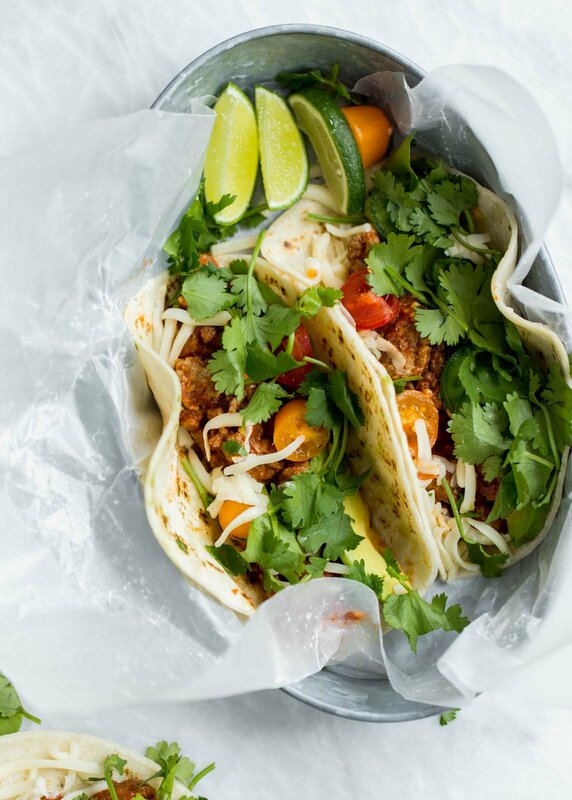 For real though, I am LOVING this warm weather and because of my very obsession with tacos, I’ve decided to share one of my absolute favorite weeknight taco recipes: slow cooker turkey tacos (with homemade taco seasoning). 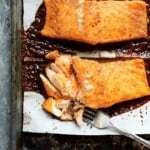 It’s become clear to me that you all LOVE some of my easy weeknight meals: turkey chili, salmon tacos, maple glazed salmon, chickpea curry, etc. 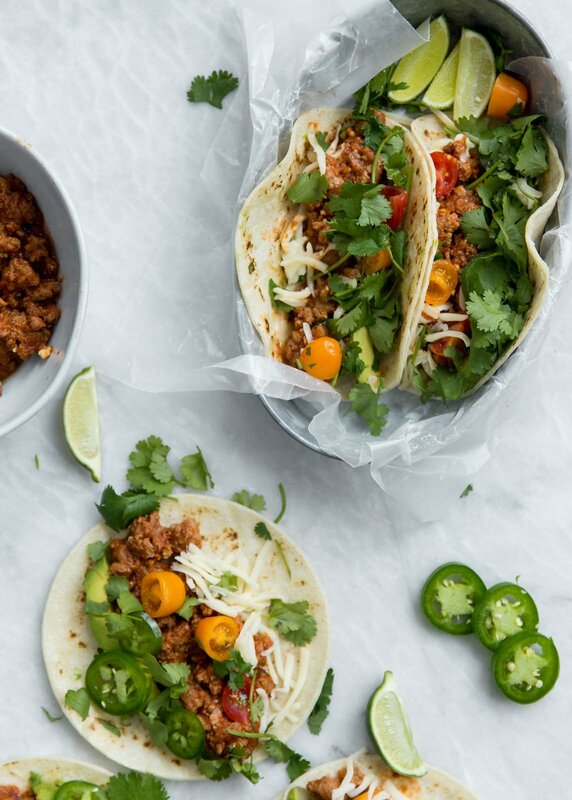 Thus, I’ve decided to put more of these go-to easy meals on the blog starting with these tacos. I know a lot of people love beef, but I’m just not into it and haven’t been for years. Occasionally I crave a burger, but it would be very, very rare for you to find beef in our fridge. I guess that’s probably why there are zero beef recipes on the blog (sorry beef lovers!). However, I find myself constantly buying ground turkey, only because it’s much leaner, but because how lovely it absorbs flavors. How about you: are you a beef or turkey lover?! Or maybe you’re a tofu lover? Holla. They’re easy. That’s right, all you have to do is brown the turkey then throw it in the slow cooker and let it simmer for a few hours. The flavors are insanely good. They can be made for a crowd, if you’d like. You can double, triple or even quadruple this recipe. 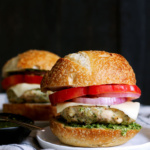 So if you’re having a party, this is a freaking awesome inexpensive meal. Hello DIY taco bar. Use this to make your own taco bar. Just get all the fixins chopped up and let your turkey cook in the slow cooker. Then have your guests make their own tacos. It’s such party pleaser. Homemade taco seasoning is involved. A few simple spices + tomato sauce and you’ve got awesome REAL deal taco seasoning with no JUNK. You can make these paleo: Simply leave out the tortillas and pile the taco meat on your favorite salad. Anyway, this recipe is a keeper. We make it 1x per week and always go back for seconds. How to serve it: with a side of your favorite tortilla chips + my famous guacamole. Enjoy! 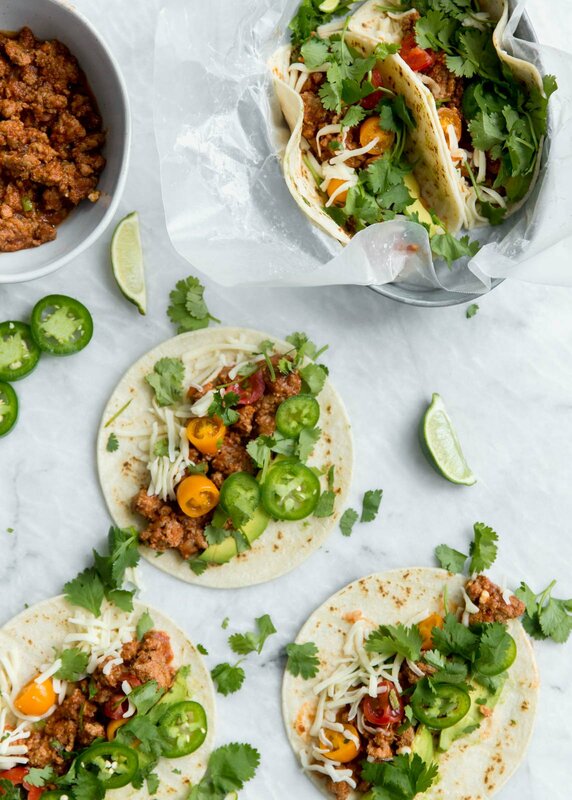 If you make this recipe, I’d love to see you tag #ambitiouskitchen on Instagram — otherwise leave a comment below letting me know how you liked the tacos! xo. Add olive oil to a large skillet and place over medium high heat. Add onions and turkey. Brown the turkey, and break up the meat with a wooden spoon until nice and browned. Transfer to the slow cooker and add in garlic, tomato sauce, cumin, chili powder, oregano, paprika, cayenne pepper and salt. Stir to combine. Cook on high for 2-3 hours or on low for 6-7 hours. Once ready to serve, divide meat between 8 corn tortillas. Add grape tomatoes, cheese, diced avocado, lettuce and jalapeno slices. Serves 4. Optional to serve with greek yogurt, if desired. To make dairy free: sub dairy free cheese or simply leave off the cheese. 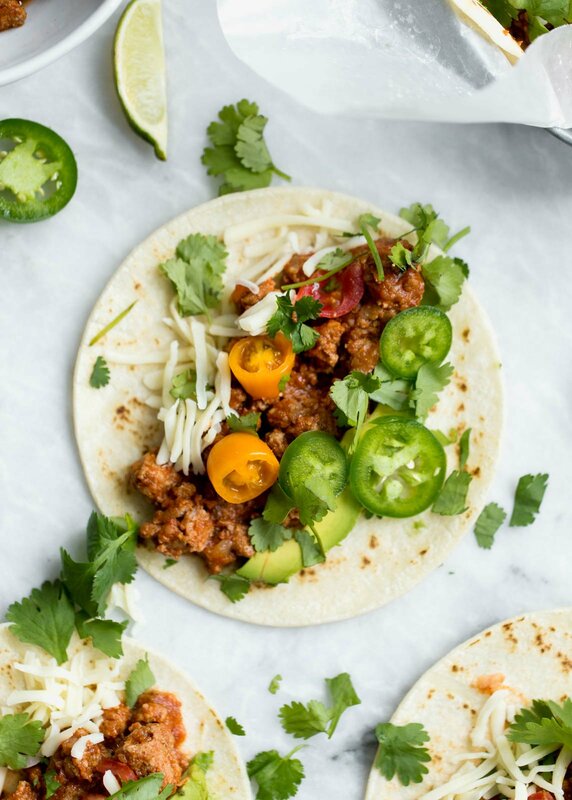 40 Responses to "Amazing Slow Cooker Turkey Tacos + video"
I feel a little bit bad that every time my husband want to go out to dinner and asks me what kind of food sounds good, I want to say tacos Every. Single. Time. So the more taco recipes the merrier. Especially EASY ones:) YUM! I made these last night and they were SO good! Even my Mexican-food-hating Husband liked them. I will definitely be making these tacos again. Nice, I love using turkey as a replacement in various recipes – meatballs, chili, etc… Excited to give these fresh tacos a try! Yum. I added black beans. Mixed with quinoa and spinach with some Greek yogurt on top for an awesome lunch. I just made these tonight. Huge hit! So tasty and so freaking easy. Will definitely make it again. Delicious!!! 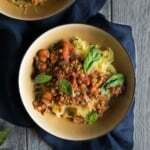 Easy, healthy and my family loved them. I’m trying them with fish next! I’m so glad the family loved these! Fish tacos are fabulous, too! In the slow cooker right now. The hubs and I could eat rice bowls everyday which is why I welcome a new taco meat mixture. I added black beans too. Thank you for the inspo! Awesome – I hope you two enjoyed!! This recipe is amazing!!!!! This is my go to for taco night. That makes me so happy!! Best taco night ever! Do you have to brown the meat first, before putting it in the crockpot? 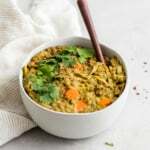 Many other recipes I’ve seen indicate you can just put the raw ground turkey in the crockpot with onion and spices, break it up when it’s done cooking, and drain any excess fat. 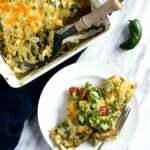 I’m looking for an easy, yummy turkey meat recipe I can throw in the crockpot to serve with a taco/nacho bar for a Super Bowl party my husband and I are hosting; since I’ll be making large quantities, I was hoping to dump everything in the crockpot, without browning the meat first, to save on time (and dishes). Would this be ok? I like to brown the meat beforehand because it gives it more flavor, but the other way you’ve read should work just fine! Tried this last night after seeing it in my feeds. I didn’t have time to make it in the crock pot, so I let it simmer on the stove for about an hour and it turned out great! Flavors were off the chart. This is my new go-to taco recipe! Amazing! So happy you enjoyed it. They’re my absolute go-to’s, too! 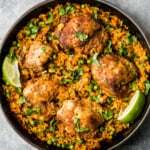 Could I make this in the Instant Pot? I am thinking it would work but not sure how much time. I don’t own an Instant Pot so I’m not 100% sure on the instructions, but I think it should work! 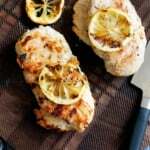 This recipe is AMAZING, and even my very picky boyfriend loved it! Next time I made it my own; I tripled all the ingredients so I would have it for lunches and emergency frozen dinners. Instead of 3 cups tomato sauce, I used 2 cups and then used an 8 oz can of diced tomatoes with chilies. (I could have just diced some tomatoes). I also added a 7 oz can of diced green chilies. At serving, I stirred in some fresh cut cilantro and used butter lettuce for a wrap. I added Mexican crema to the topping choices. A keeper recipe either way! That sounds delicious! Love the extra cilantro and the lettuce wrap idea 🙂 So good! Have you ever tripled this? We are having a Fiesta graduation party and I wanted a big batch. You can definitely triple this! Can I just say, THESE ARE THE BEST TACO RECIPE I HAVE EVER MADE. I have not found a taco recipe that I have loved in FOUR years. This recipe is AMAZING. I just used a taco seasoning packet instead cause I didnt have all the spices on hand. Amazing just amazing! So happy to hear that Gerry!! Love this recipe – it’s perfect for adapting with your fav spices, too! I mixed the taco mixture in with spaghetti squash to make a pseudo taco bowl rather than the tortillas. Delish!